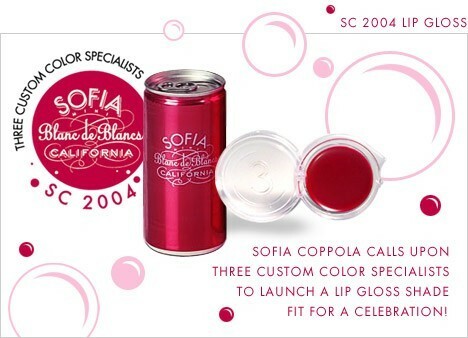 In 2000, Sofia Coppola sent us two of her favorite lipsticks to us from which to create her own signature shade. She called upon us again shortly thereafter to help her create Doubles Lip Gloss, a glossy ripe blackberry shade in a wand, which was used to help launch the full-size Blanc de Blancs sparkling white wine from Coppola Wineries. In 2004, we were thrilled when asked to create yet another shade for the launch of the adorable Sofia Mini Blanc to Blancs. SC 2004 is a luscious sheer raspberry stain in a balm-like texture packaged in our swing0out pot. A delicious, ripe blackberry created for Sofia Coppola. a sheer, raspberry stain. This also makes a great cheek stain - try a dab on cheeks to give a healthy flush. Created for Sofia Coppola.